M/S. Perma Construction Aids Pvt. Ltd. is a reputed name in the field of Waterproofing and Construction Solutions. We have ISO 9001: 2008 Certification, along with the rating of SE-1A from CRISIL which altogether strengthen our reputation in the market. We are one of the prominent Manufacturers, Exporters, and Suppliers of Waterproofing and Construction Products. 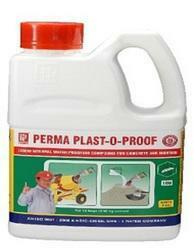 Perma Plast-O-Proof STD is an integral waterproofing compound, ideal for use with both Concrete and Plasters. Plast-O-Proof is based on specialized surfactants and synthetic resin which impart superior flow and cohesive properties in concrete and mortars. Use of integral waterproofing compounds in concrete and mortar is one of the precautions taken to achieve a waterproof concrete or plaster. Add Plast -O-Proof STD in concrete and mortar along with water at the rate of 100 gms per bag of 50 kg cement. In demanding situations the dosage could be doubled to 200 gms. It disrupts the capillary network within the concrete mass which could conduct water through concrete. It significantly reduces water demand to bring down W/C ratio in the range of-0.45 which generally represents a sound concrete. It reduces the possibility of shrinkage cracks. It improves adhesive and tensile properties of mortar. To improve workability and trowelling properties of sand/cement mortar mixes during application. Selection of good aggregates, sand and cement. Adhering to W/C ratio in the range of 0.45. Proper mixing, placing and curing. Use of a good integral water proofer. Compatibility : Compatible with all OPC, PPC and Slag cements. We are highly engaged in offering a huge range of Waterproof Your Terrace with Terrace Waterproofing Chemicals service to our valuable clients. Our service helps in compelling and vibrant showcasing of the company attributes to the entire market. Our range of these waterproof coatings is widely used in newly constructing buildings such as shopping complexes, residential buildings. Our products are preferred for its fast and convenient, suitable back up functioning and also for its promptness and reliability. Clean the surface to remove all loose particles and any deleterious matter. Repair all cracks, honeycombs and blemishes from the concrete surface. Brush-apply Eazee Coat primer on the entire surface liberally. Primer is prepared by diluting one part by volume of Eazee Coat with one volume of water. When the primer coat is just dry apply the second coat running the brush perpendicular to the first coat. Provide scrim or fibre-glass fabric at J bolts and junction of sheets over one coat of bitu Coat and then brush apply Eazee Coat on the entire surface in two coats. On the cleaned plinth apply two coats of Eazee Coat. The second coat is applied after about four hours of the first coat. When the second coat is still wet blind it with clean sharp sand to provide mechanical key. Plast-O-Proof is an Cement Water Proofing used in integral waterproofing , ideal for use with both Concrete and Plasters. Plast-O-Proof is based on specialized surfactants and synthetic resin which impart superior flow and cohesive properties in concrete and mortars. Use of integral waterproofing compounds in concrete and mortar is one of the precautions taken to achieve a waterproof concrete or plaster. 1. Durability is increased due to air entrainment. 2. Segregation bleed and thereafter honeycombing is prevented. 3. Surface finish of concrete and plaster is improved. 4. Attacks by Sulphates and chlorides from ground water in coastal areas is well tolerated. a. It disrupts the capillary network within the concrete mass which could conduct water through concrete. b. It significantly reduces water demand to bring down W/C ratio in the range of 0.45 which generally represents a sound concrete.
. It reduces the possibility of shrinkage cracks. a. It improves adhesive and tensile properties of mortar. Use of a good integral waterproofer. It is emphasized that integral waterproofer and plasticisers only help in making a good concrete better. Hence observance of good construction practices is of utmost importance for achieving the overall goal. Compatibility : Compatible with all OPC, SRC and Slag cements. Polyurethane Waterproofing. 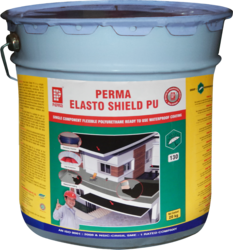 Perma Elasto Shield PU is a single component VOC compliant, ready to use, liquid polyurethane based waterproofing membrane. It is composed of a blend of polyurethane and selected hydrophobic fillers, minerals, gelling agents and special stabilizers. It cures by reaction with humidity, maintains its elasticity and is suitable for use both on horizontal as well as vertical surfaces. Upon curing Perma Elasto Shield PU forms a tough and flexible membrane which is resistant to a wide range of temperatures, oxidation, radiation and Ultra Violet light. As an excellent water repellant on concrete, plastered or exposed brick, block surfaces. As a good water repellent on clay tiles, roofing tiles and paving blocks. As a post construction DPC against rising dampness. As an admixture in the manufacture of blocks, bricks & clay tiles. No solvents are involved. The product is water based hence no toxic hazards. Treated surface can be painted over. Good penetration. 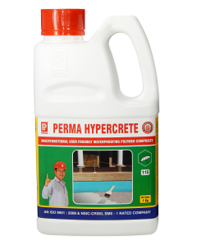 Dilute Perma Treat-WB with soft potable water and brush or spray apply on the dry vertical or inclined surfaces. However spray application is preferred for better penetration of the surface. While spray applying concentration of spray should be kept such that at least 300 mm of drip flow is seen. Dilution rate and coverage on various surfaces are as follows. Note: if the water available is hard then procure soft water or soften the hard water with EDTA (Sodium Salt of Ethylene diamine Tetra Acitic Acid). A pinch of the chemical in a bucket of hard water will make it soft. Treated surfaces develop water repellency only after 72 hours in hot weather. Un Painted Plastered Surface 1:15 500 sq.ft. Concrete Surface 1:10 1000 sq.ft. Clay Tiles 1:10 1000 sq.ft. Perma Guard: It is a polymer modified cementitious water proofing system with a very wide scope of applications in water proofing and corrosion inhibition situations. Perma Guard is a two component material which forms a flexible reinforced membrane upon curing. 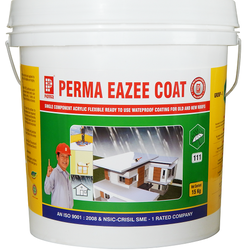 Perma Shield: It is straw coloured liquid which has excellent waterproofing and protection properties. 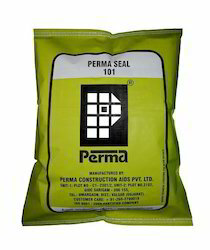 Perma Shield is effectively used in arresting nagging leakages and dampness form walls and protecting exposed reinforcements. It is flexible upon curing and it forms a membrane coating on the applied area. 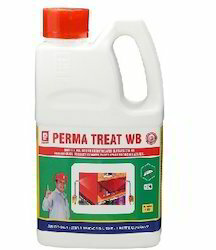 Perma Treat: Perma Treat is a colourless solvented silicon based liquid which imparts permanent water repellent effects to the walls, stones brick work and cement painted surfaces. 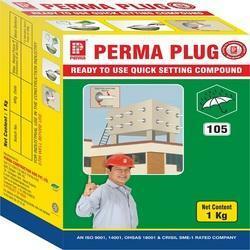 Perma Plug: Perma Plug is a quick setting cement sand mortar supplied in dry powder form. This constitutes a blend of cements graded sand and chemical set control agents. The product needs only on site addition of required amount of water just before its use. We hold the expertise in offering water stop construction joints, traditional preformed water bars were not user friendly and frequently disastrous, as it stalled the co-creating because of its massive size in the shutter as well as the water bar nailing to the shutters to keep them in the position. To solve this problem Perma offers efficient water bars for construction joints that swell in the center of the construction joint post construction under pressure, when it’s exposed to the water from leakages. Perma Hydro swell is easy to install, it only needs nailing in position at the center of the construction joint before the succeeding pour. We proffer a prominent manufacturer and suppliers of waterproofing chemicals; with extensive market experience and industrial understanding, we offer an affluent assortment for the waterproofing products, waterproofing solutions, waterproofing powder, Leakage solution chemicals. Our product range is extensively utilized in new constructions such as residential constructions, domestic constrictions. Apart from these, we are also renowned for providing waterproofing Liquid. We are a leading manufacturer and exporter of an extensive range of Crystalline Waterproofing to our Distinguished Clients. These products are manufactured by utilizing Perma Seal Powder acquired from trustworthy vendors in the market. Our range of Crystalline Waterproofing products is used in an assortment of applications such as arresting leakage from old as well as new leaky overhead and subversive water tanks. We offer these products to our clients at market leading rates. To fulfill various prerequisites of consumers, we proffer an optimum quality range of RCC Terrace Waterproofing products to our distinguished clientele. Under the guidance of our experienced, competent personnel, we also offer assistance to make consumer comprehend the intricate waterproofing solutions. We bestow these prices at the market leading rates all across the globe. Injection Grouting Water Proofing comprises two components; one is pre polymer resin and the other being catalyst. Both of these components blended and injected into the concrete or the RCC structure, by utilizing single component pump, which can be manual or motorized. When injected grouting waterproofing creates a partially rigid and partially foam constancy when it is exposed to moisture or water. We are manufacturers and exporters of a wide range of water based Acrylic Waterproof Coating, these are fabricated utilizing superior grade raw materials with advanced technology. These products are flexible, water resistant coating appropriate for waterproofing systems and roof sealing used in transference with membranes. Acrylic Waterproof Coating is an exceptional adhesion for prophetically prepared surfaces. Looking for Waterproofing Solution ?